PES Cartridge filters are made of Poly EtherSulphone with Uniform pore distribution to ensure maximum performance in Bacterial retentions. Its upstream & down stream polyester support ensure resistance to pressure shocks. Polyethersulphone membrane is hydrophilic in nature, it allows easy integrity testing for all applications where daily controls are required. 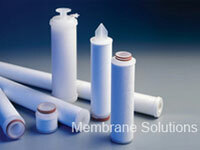 The membrane possesses broad chemical compatibilities & contains no surfactants. MS®PES Cartridge filters are produced in controlled environments & under stringent production conditions that ensure filter quality & cleanliness. Their assembly is performed integrally by thermowelding. This processes minimizes the presence of oxidization of substance & yield durable filter cartridges suitable for extended use. This can be sanitizes by chemical agents or by inline steaming.